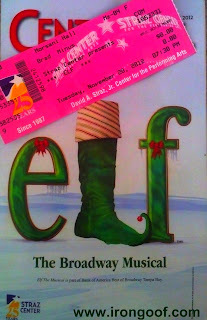 The Tampa Bay Bloggers had an opportunity to see Elf the Musical on opening night and as a new member I was thrilled at the chance to take part. Now as I am a new member I am not sure of the background of my fellow bloggers, but I do have a modest amount of training and experience in theater (www.bradminus.com), so I may be just a tad more specific especially on the acting, but nevertheless I hope my review will be informative enough to help you decide whether to see it or not. Just a little foreshadowing….go see it. Elf the Musical is based on the 2003 holiday movie Elf starring Will Farrell about a human baby who found his way into Santa’s bag during his Christmas visit to a local orphanage. Since the boy was already an orphan, Santa and his elves decided to raise the child at the north pole just as they would any elf child. The problem was Buddy, the human boy, grew to be over six feet tall. After a small slip of the tongue by one of the other elves, Buddy learns that he is indeed human and asks Santa about his parents. It is then that Buddy decides to go and find his father in the big city of New York. NETwork Presentations LLC’s production of this family Christmas musical was alive with high energy musical numbers, colorful set pieces and smooth transitions from scene to scene. In the past decade or two, Broadway and national tours have started to move toward high tech sets and stage work which include hgh intensive set changes, creative light and sound effects, and even some pyrotechnics. Very recently I have noticed a small shift back to a more classical route where the set pieces are simple but painted well, the lighting is simple and the music and sound are achieved by a live orchestra instead of musical tracks. This musical is a perfect example. This simpler style has shifted the responsibility of the quality of productions back to the performers and less to the designers of sets, sound and lighting. In my opinion it makes for a better show, but I may be a little biased. The play opens up with Santa (Gordon Gray) sitting in his living room fighting with his television set. He opens the fourth wall and greets the audience as if we were sitting on the floor right in his living room. After subtly turning off his cell phone, he opens a book and prepares to tell us the story of Buddy the Elf. At the point the living room is whisked away to Santa’s workshop where the elves are preparing for Christmas. Gordon’s depiction of Santa throughout the play is wonderful. His energy and boastfulness helped me to get lost in the show and actually believe I was at the north pole. Matt Kopec’s characterization of Buddy is spot on as his high energy, child like characterization makes the audience believe this six-foot boy really does believe he is an elf and is horrified when he finds out he is actually human. Matt’s singing voice is pure musical theater and was a joy to hear every time he opened his mouth. I found myself waiting impatiently for his next number. The real treat came from the character of Jovie (Kae Hennies), who captures Buddy’s heart the moment he sees her in the office of his biological father, Walter Hobbs (Drew Culver). Jovie has to be coaxed in to singing during the number “A Christmas Song”, but when she finally decides to sing out, her voice beautifully resonates throughout the theatre and when paired with Buddy’s the duo create pure musical brilliance for any ear. Other notable performances were by Michael, Buddy’s half brother played by Connor Barth who even as a young actor, had a mature voice for his age. He tended to get a little pitchy in the upper registers, but because of his characterization was easily missed and forgivable. Julia Louise Hosack played Emily Hobbs, Buddy’s step mother, also had a fantastic musical voice and she was able to lead Michael into musical duets that gave me the “warm fuzzies”. The connection and chemistry between these two well trained actors allowed me to believe they were really mother and son. The only drawback of this production that tugged me out of my holiday nirvana, was the voice of Drew Pulver whom played Walter Hobbs, Buddy’s father. His performance was not inferior, it just did not mix well the rest of the ensemble in my humble opinion. It was obvious to the audience that most of the ensemble were trained in contemporary music or musical theater When Walter sang it was clearly operatic, to a point where the words were garbled and I couldn’t make out the lyrics. Unfortunately, every time he sang it was distracting and his voice did not meld with the rest of the ensemble. This show is classical musical theatre with simply painted sets, wonderful acting, and is sure to bring a smile to you and your family should you decide to see it. It is a true Holiday treat. 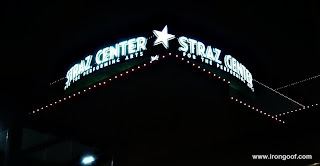 Fri. 2 and 8 p.m. Sat. 2 and 8 p.m.
Sun. 1 and 6:30 p.m.
Great review! Nice to meet you last night! Thank you very much and thanks again for the opportunity. I hope to continue to take part in more activities.